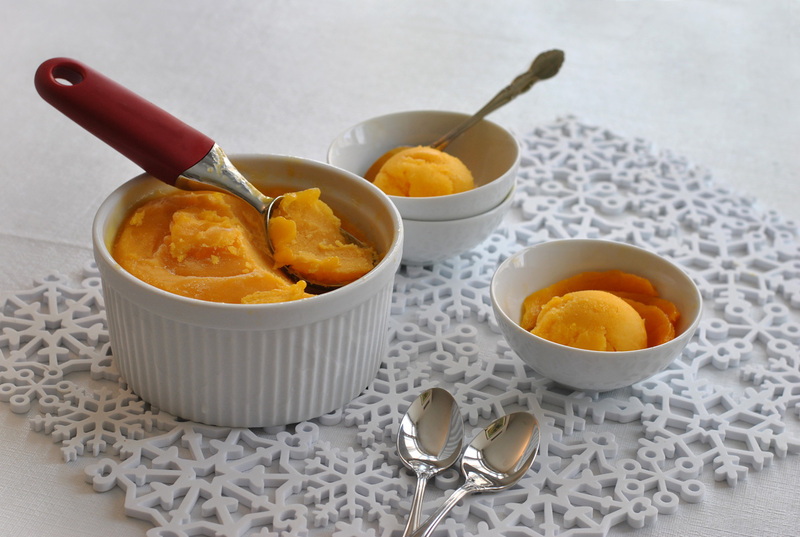 What I usually do when my fridge is abundant with ripe mangoes (which is rarely the case) is whip up this fast and easy fruit sorbet. You see, a close family friend recently sent me a big box of fresh mangoes that he grows in his own back garden in Florida (is it just me or is anyone else extremely jealous here?!). Naturally my first instinct is to create a very simple dessert that enhances the wonderful and refreshing taste of mangoes. Sorbets are a combination of fresh fruit juice and sugar syrup. The latter sweetens the fruit juice and affects the sorbet’s texture– you don’t want it too icy or slushy but creamy and smooth instead. To reach that consistency, the ratio of fruit to syrup has to be just right; I read a great tip on The Kitchn that involves floating a large egg – yes and egg! – in the sorbet mixture before churning it in the ice cream maker. If the egg sinks below the surface then you need to add more sugar and if the egg is completely afloat, then you need to desaturate the mixture with either fruit juice or water. The sugar levels are balanced when you see a 1 inch (2.5 cm) size of an egg shell on the surface. Obviously this method might not work on all fruit sorbets since some fruit juices can be too thick, but it’s a good tip to keep in mind. I want to point out that every fruit is different and every sorbet mixture needs more or less sugar (less sugar for very sweet pineapples, for instance). Also, thicker fruit juices might need to be diluted with water to get a silkier structure. It’s all about understanding the science and process of creating sorbets from scratch (here’s another great read!). 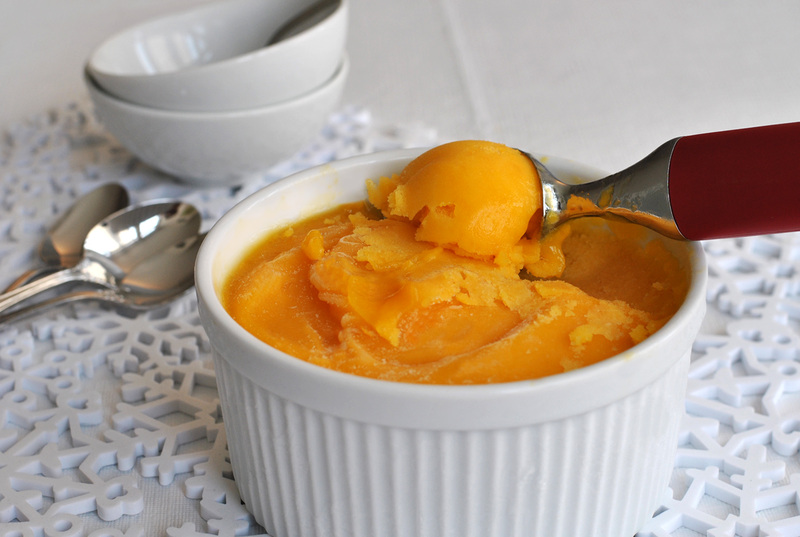 Did you ever try making homemade sorbet? I’d love to hear about your trial and errors! Freeze ice cream maker at least 24 hours before making the sorbet. Dice the mangoes into bite-sized pieces ∼ around 5 cups. Make the simple syrup by combining the sugar and water in a small sauce pan. Bring the mixture to a simmer over medium-high heat, and stir a few times until the sugar is completely dissolved in the water (2-4 minutes). Remove from heat and cool. Combine the mangoes and ¼ cup of the simple syrup in a blender or food processor and blend until the fruit is liquified. Strain the mix if the mangoes are too fibrous to remove any solids (you can use a cheese cloth or towel paper). Gently stir with a spoon as you strain. Test the sugar levels with the egg-float test that I described earlier and make the necessary adjustments. If the egg completely sinks then add more sugar syrup, and if the mixture is too thick then add more water. 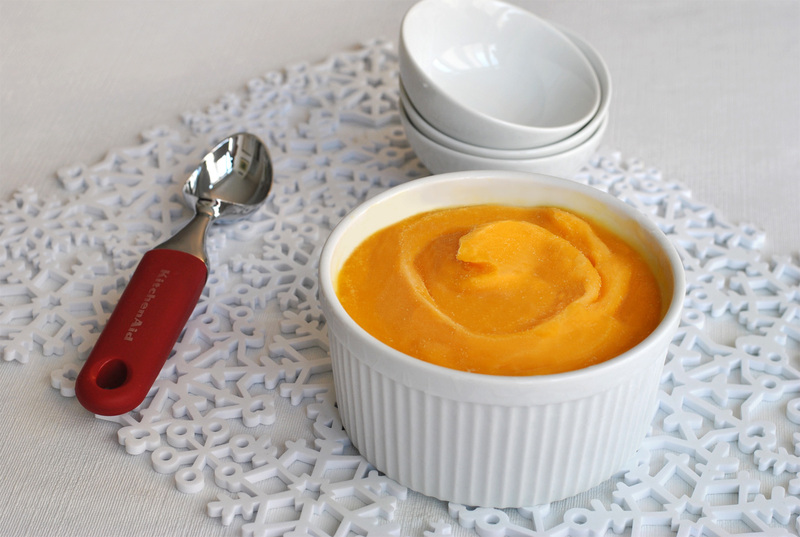 Cover the sorbet base and refrigerate until very cold, at least 1 hour or overnight preferably. Pour the chilled base into the ice cream maker and churn to get a consistency of a thick smoothie (15-20 minutes). Transfer the sorbet to a freezable container and cover. Freeze for at least 4 hours, until the sorbet has hardened. Can be stored up to a month. 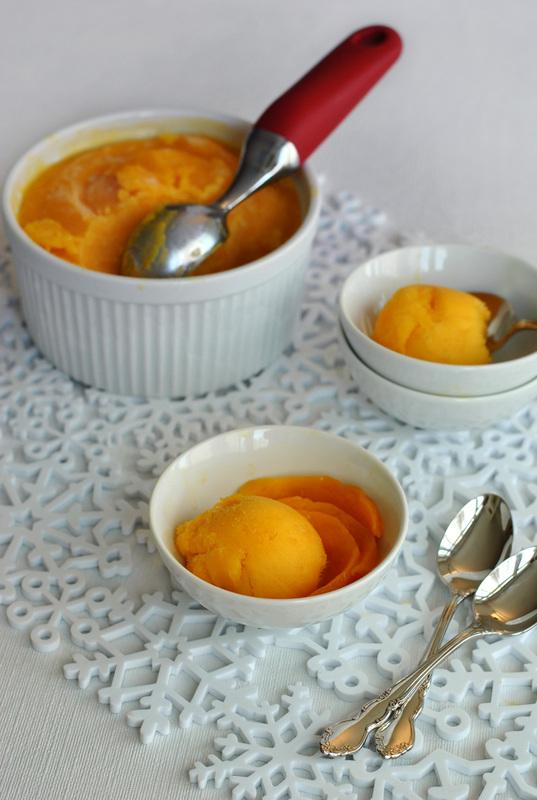 Let the sorbet soften for 10-15 minutes in room temperature before serving.